There’s no way to understate this: the HURT 100 is hard. I ran it well, and up to a certain point I think I ran it smart, and it’s still only due to the help of the amazing race volunteers and fellow runners that I was able to make it through to the end. If it had been a hotter year, I might not even be able to say that much, and most of us who started the race this year couldn’t. I came in knowing it would be hard, and I was neither disappointed nor underestimating the task. That wasn’t exactly the same as being prepared for how hard it would be. No matter how much I’d read, how many videos and photos of the course I’d looked at, the true relentlessness of the run wouldn’t sink in until I’d run at least one full lap. 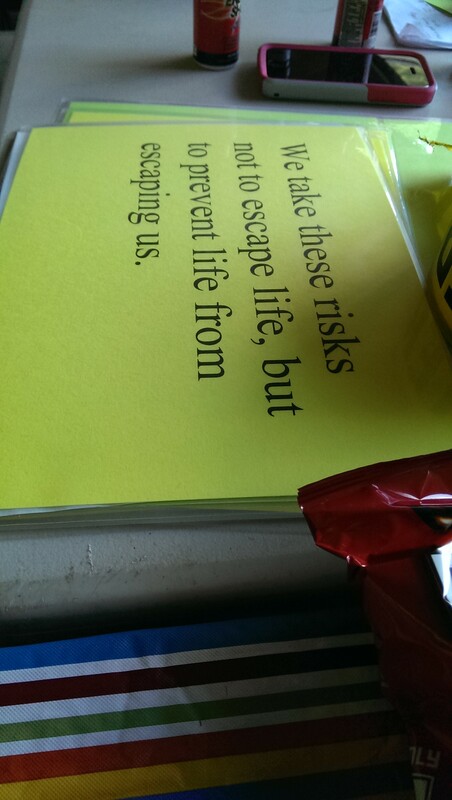 It was also one of the most intense experiences of my life, maybe least of all physically. 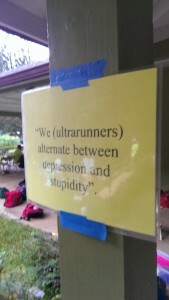 People who talk about ultrarunning being a mental sport but haven’t run HURT might just be repeating filtered wisdom from someone who has. Esthetically, it was beautiful and haunting and unforgettable. Emotionally, it was deep and raw and tough and sweet, and I’ve cried less over break-ups than I did over finishing successfully. 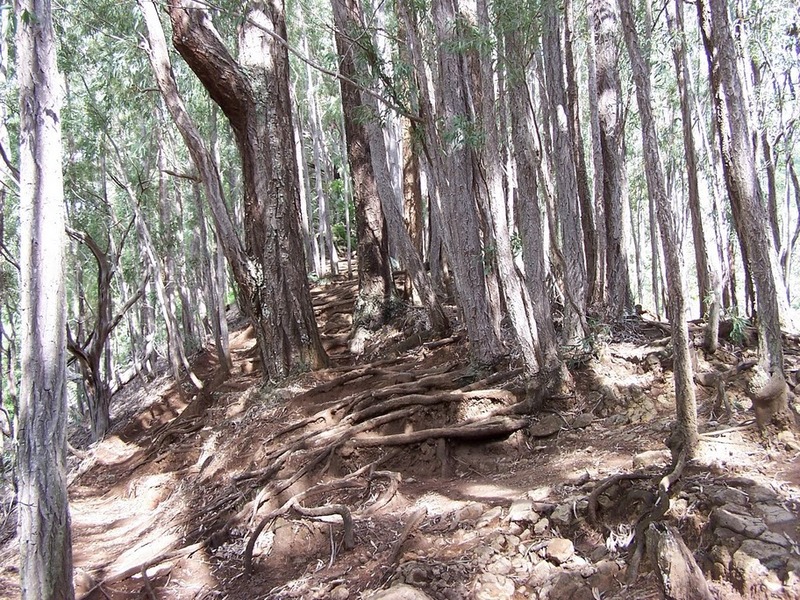 In brief, the HURT 100 is run on five loops of a 20-mile course which climbs Honolulu’s Mt. Tantalus three times on each loop. If you’re familiar with Honolulu, Tantalus is due north of Waikiki, and you may have been there as a tourist to see Manoa Falls or Round Top Drive (both on course). If not, just know that Tantalus is steep as hell and covered in dense Hawaiian rainforest. In total, there’s just a few feet shy of 5,000 feet of vertical climbing per loop. This means the average grade on the course is close to 10%. That’s not what makes it hard. A couple days before the race, I went out for a preview with Ken “Running Stupid” Michal and co. We hiked and ran the shortest of the three legs of each loop, from Paradise Park through Pauoa Flats to Nu`uana-Pali Drive. Even though Ken, like me, was only in town for race week from the Bay Area, he was able to give me a lot of good tips. This year would be Ken’s fourth attempt at finishing the full hundred miles, so there might not have been a better source of info on what could go wrong at HURT and how to persevere. Each of three legs of the course finishes a 12 to 1600 foot climb at Pauoa Flats, a roughly quarter-mile section of trail that flips open the dictionary to the word “gnarly” and asks, “Are you sure you really wanted that? Because I can keep going.” True, there are a few spots where the ground isn’t literally coated in Banyan roots. Yep. There are a few. By the time we made it to Nu`uanu (the end of the second leg) I had a better understanding of what I’d be up against, and of all that Ken had pushed through over the past three years’ runs, but still no true grasp of the weekend ahead. I showed up on race morning rested and excited. 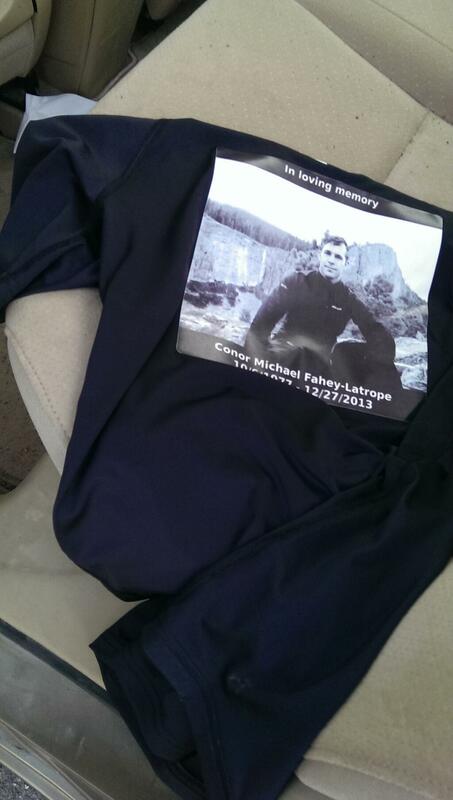 The run starts at 6am, which in January means more than an hour of darkness still lay ahead. I waited at the back of the pack, which would help force me to take it slow up the first climb, a steep hill just around the corner from the starting line called Hogsback. When we topped out at Round Top Drive (just before Pauoa Flats), I took advantage of my better downhill running speed to pass more than a dozen people, landing solidly in the middle of the pack by the first aid station. On the climb back up, almost half of those people would pass me again, since I tend to be a slower uphill runner. This didn’t matter much to me, since I would overtake them at the Flats or coming down the other side by the time we got to the other station. In some cases, we would leapfrog each other this way predictably for as much as 80 miles. The majority of the trail is technical, requiring close attention to your footing if not the copious roots, slick rocks, and dangerous drop offs, with occasional scrambles or two-foot high step ups. This hits everyone in their weak spot, whether it’s ascending or descending or just staying upright. No, that’s not what makes it hard either, but we’re getting closer. I caught up with Ken at the top of a steep scramble (coming up to Bien’s Bench) after the second aid station. I was a little worried that I was going out too fast on the first loop, but my pace felt comfortable there, so I took his encouragement to pass instead of running with him for a while. I’d be seeing plenty more of him, anyway. On our way up we met another repeat attempter Jennifer-Anne on her way down, already, as she put it “puking out.” She’d get back to the start and spend the rest of the weekend volunteering. Some of it in a giant cockroach costume. 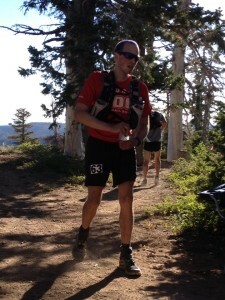 I finished my first loop in 5:15, refilled my bottles and turned around for another climb up Hogsback. Now in the daylight, without the big crowd at the back and the excitement of the early going, I could learn to hate this hill. Between the heat of the day and the encroaching fatigue, I still felt generally good but my ascents were already getting much slower. All told, the second loop would take me about 75 minutes longer. With 40 miles done and the night about to begin, I was starting to worry that if my time kept dropping off, in the end I would too. This is precisely what makes HURT so hard. No other mountain hundred I know of has such aggressive cutoff times tuned precisely to chase down mid-packers like myself. 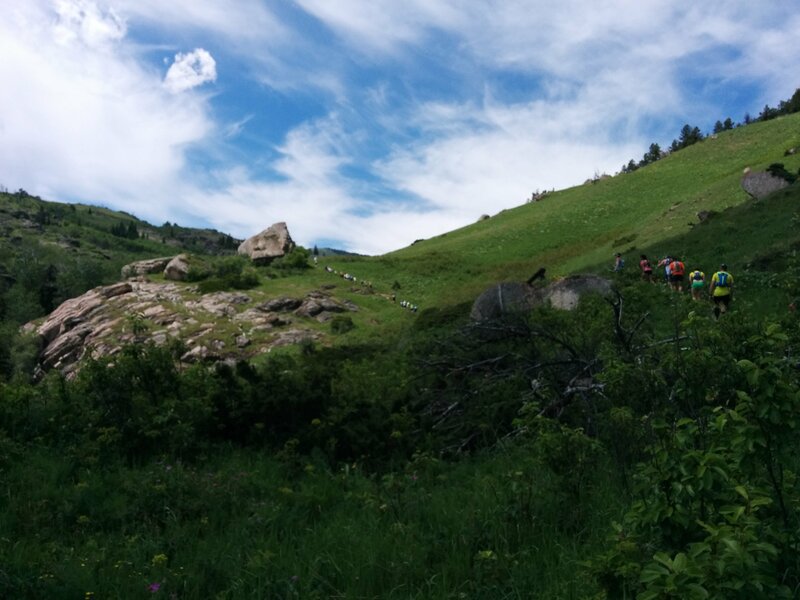 I have no doubt that Hardrock is a tougher course, considering it climbs an additional 8,000 feet and summits the odd 14,000 foot peak for a lark, but with 48 hours to finish most runners never need hurry just to meet the time limit unless something goes wrong. HURT, however, has a 36 hour time limit, with hard cutoffs throughout the last loop starting at 29 hours in. This means that even if you make all the cutoffs with time to spare, you never really get a chance to stop worrying about them. You can’t rest for longer than you absolutely need to. You can’t slow down, zone out, and coast along one of the few relatively easy section of trail. You have to stay focused on running your best for as long as 36 hours . Although I didn’t get to enjoy as much scenery, the nighttime portion of HURT might have been my favorite. Things cooled off enough on the third loop to offset most of my encroaching fatigue, and the rainforest has its own kind of beauty by headlamp. I’ll never forget the sound of wind picking up in the giant bamboo groves high above Manoa Falls. My third loop took 7:43, or again about 75 minutes longer than the previous loop. On loop four, I deployed my Caffeine Strategem. I’d stopped drinking coffee a month before, and quit caffeine altogether a week after that. I cracked a 24-Hour Energy and mixed it into one of my bottles of electrolyte drink, and sipped it on my way up Hogsback. By Pauoa Flats I was flying over the roots and crooning along with my iPod at top volume (my apologies to any delicate eardrums I may have passed on the way). I refilled that bottle with Coke at the bottom. All told, I moved up 15 places and ran my fourth loop ten minutes faster than my third. Early on loop five, though, the wheels came off. 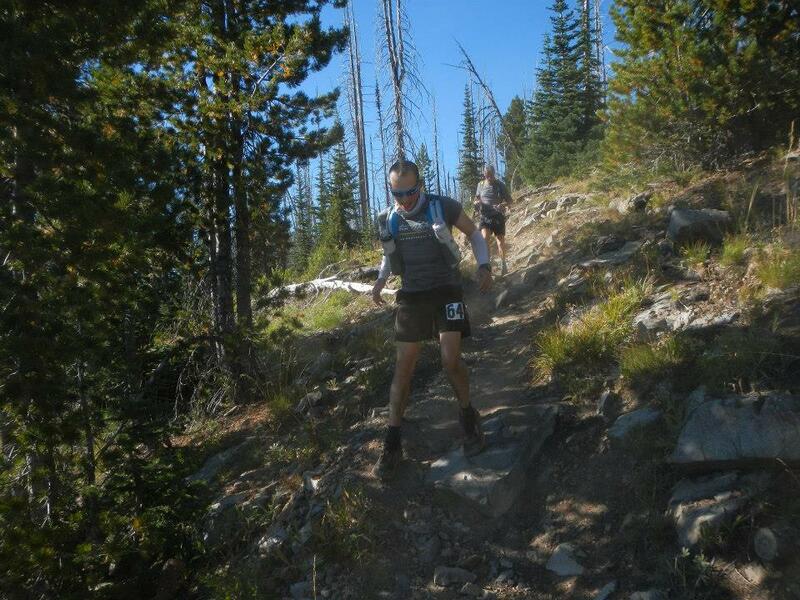 I took it slow up Hogsback as the second day of the race began to heat up. By the second half of the first leg’s climb, I was feeling a little queasy, but I took some ginger and tried to push through it. I let another runner and his pacer push me to run the rest of the climb faster than I usually would have, and just before the top I pulled over and insisted they run on. I tried to force myself to vomit but nothing would come up. Well, that was dumb. With four miles left to the first aid station of the loop, I was dehydrated. I had some water in my pack’s hydration bladder, but for whatever reason it wasn’t tasting good to me and I could only get small sips in irregularly. 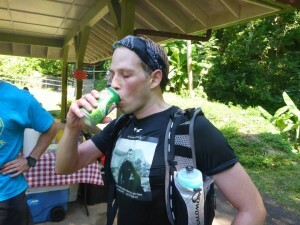 Neither electrolyte drink nor Coke was at all palatable, and I did my best to force as many sips of water as I could, and maintained my pace for the rest of the leg, finishing with a good downhill run into the Paradise Park aid station. Where I asked for water, and collapsed on the pavement. The HURT volunteers jumped to my aid and saved my run. I was given cup after cup of cool water (the first of which I couldn’t keep down). A cold towel was placed on my head. Someone sat with me and rubbed my back and shoulders while someone else got me a cup of cold vegetable soup and refilled my pack. After maybe ten minutes when I was ready to try moving on, two of them walked up the road to the trailhead with me. I was still unsteady for another mile or so, but I absolutely owe my finish to them. Photo from @HURThawaii Twitter stream. Shortly thereafter, a runner coming into the aid station who had already timed out and was just completing her 67-mile “fun run” handed off her trekking poles to me. I don’t know what difference they made for my overall time since I’m not used to running with them and they interfere with my fast downhill style, but they were great for that uphill section while I was still shaky after letting myself get so low. I owe another big thanks to #55. The next leg was by far the slowest of the race for me, at barely over two miles an hour. It was the only time I dropped more than a couple places. At the final aid station, I was fairly sure I’d make it as long as I kept pushing, but I had an eye on my watch climbing back out again and was just as worried about the few runners left behind me. At one point, ten minutes after leaving the station where the cutoff would be coming up in twenty, I remember bellowing up the trail, “Ken! You’d better be up there and you’d better be running hard!” Not two minutes later he and his pacer came running down past me, looking as determined as I’ve ever seen anyone. After I met Franco Soriano sitting on a rock, timed out a mile above the last checkpoint, I cried thinking about how hard he’d fought and how close he’d come. Many runners quit at mile 67 if they think the cutoffs will be too close. Franco made them chase him down. Shannon MacGregor caught up with me on the steepest part of the last climb, and we pushed each other along. He ran on ahead to Pauoa Flats, where I limped in thinking I was alone and stopped to stretch. I stretched one quad, and screamed. I stretched the other, and screamed. I leaned against a root to stretch each calf, and screamed twice. We pushed each other along a little bit more, to the end of the last extra bit of climbing up to Manoa Cliff, and Shannon ran on down ahead. I didn’t have the legs for it yet. I packed up my poles, and shuffled along for most of the descent, until the last mile, and suddenly I was off. It seems to happen to me for the last mile of every run – I just smell the finish and remember how to run. I tore down the last bit of trail, over the bridges, and into the Nature Center right behind Shannon. There was still a big crowd hanging around to cheer for me as I reached the finish sign, which I touched, kissed, hugged, and sobbed over. We wouldn’t want it to be easy, indeed. I guess I passed Patrick Castello on my way in, and he finished another minute behind me. I never saw him. Eight minutes later, Ken crossed the bridge and rounded the corner into the Nature Center. 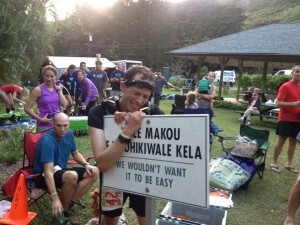 I have never seen an ultrarunning crowd go wild like it did for him as he successfully completed his fourth attempt at the HURT 100 with fifteen minutes to spare. What makes HURT so hard is not just the distance, the terrain, the course, the footing, and the heat, but the fact that it’s meant to be nothing less than the hardest challenge it could be. 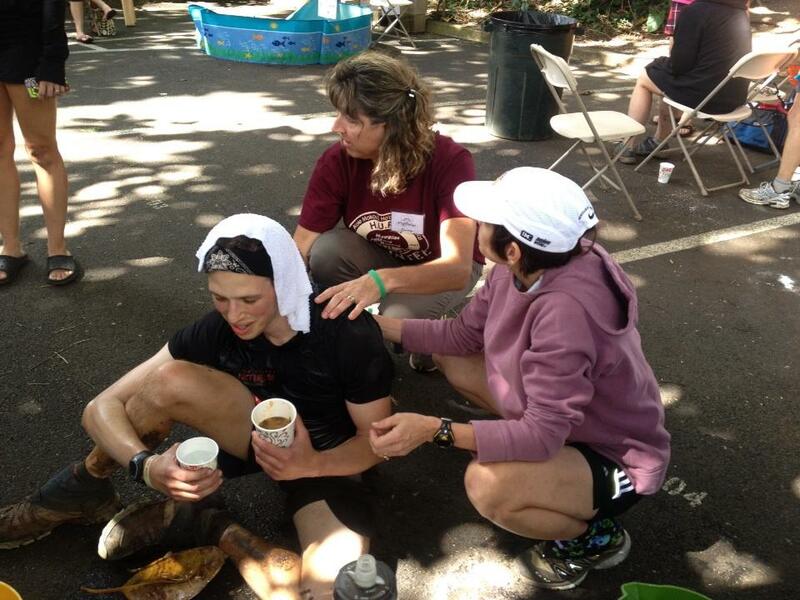 What makes HURT possible to run is not just the dedication and the passion of each runner, but of the entire network of HURT runners and volunteers, all 300+ of them. Mahalo. `Aole makou e ho`ohikiwale kela. : I know this may sound like a lot of other trails, but let me put it another way: there are actually brief sections where the trail itself goes over roots. The footing includes no dirt, rock, gravel, or artificial walkway, just a mass of gnarly uneven toe-stubbing fascia manglers. : Of course, if you’re a faster runner you have to spend the whole run worrying about running your best while focusing on your footing. Unless there was one I didn’t hear about, this may have been the HURT 100’s first year without a broken bone. The day after Thanksgiving, while many of countrymen apparently were lining up to fight over consumer electronics, I took advantage of the extra day off work to wake up at 4:30 AM and drive straight to Yosemite National Park. My plan was to run that day, camp that night, run the next day, and then drive home. Depending on how much time I had on Friday, I would either go for a long but gentle run on Friday followed by a short but steep run on Saturday, or vice versa. Yosemite had a few tricks up its sleeve for me, and things did not work out exactly as planned, but for such a loosely planned solo trip I have no real complaints. I made it to Hodgdon Meadows inside the park boundaries and had my camp setup by around 9 AM, but with one key element missing that would come back to haunt me later: no firewood. I figured I’d either swing down through the valley for dinner or stop at the Crane Flat gas station after my run to pick some up since gather wood at such a heavily used campground is a bit of a fool’s errand. Judging by the temperature at that hour, it was going to be a chilly evening, and I was definitely going to want a fire to sit by before crawling into my tent. The good news was that with such an early, I’d be able to get my long run in that day. The route I had picked out would take me from the Foresta trailhead on Big Oak Flat Road up and over the sub-alpine shoulder of the north valley wall to the summit of El Capitán ten miles out, where I would have my lunch and turn around. 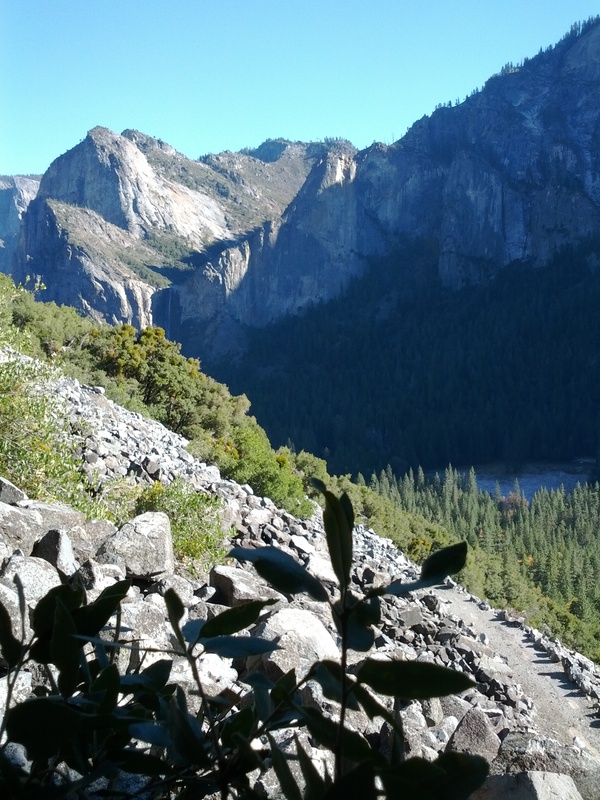 I started my day heading up switchbacks at 5,000 feet, through scrubland that was burned out twenty years back, with views of the eastern side of Yosemite Valley and the snowy mountains beyond. A couple miles later I was weaving through dense pine with a couple of trick stream crossings. cruising along but struggling a bit with the thinner air. At four miles I came to the only major junction on my map. The trails here were clearly marked, both on paper and in the real world. I took the right branch, which was marked El Capitán. Unfortunately, there was another turn off to the left which I never saw (even on the way back, when I knew to look out for it) and the more obvious path I stuck to is not marked on any of the four maps I looked at that day, so I didn’t know to watch out for a second junction. By the time I realized I was headed toward the base of El Cap rather than the summit, I was worried about how long it would have taken to backtrack and finish out the run rather than continuing on and turning back at a good halfway point. I had hoped to run on the North Rim Trail, but instead found myself descending 2,000 feet on Old Big Oak Flat Road, once the main route into the valley. As it has been so thoroughly abandoned, it looks as though the park service is trying to encourage reclamation of some the upper sections of the paved road. For me, this meant jumping and climbing over downed logs and whole trees for more than a mile, which look as though they will be left to mulch. 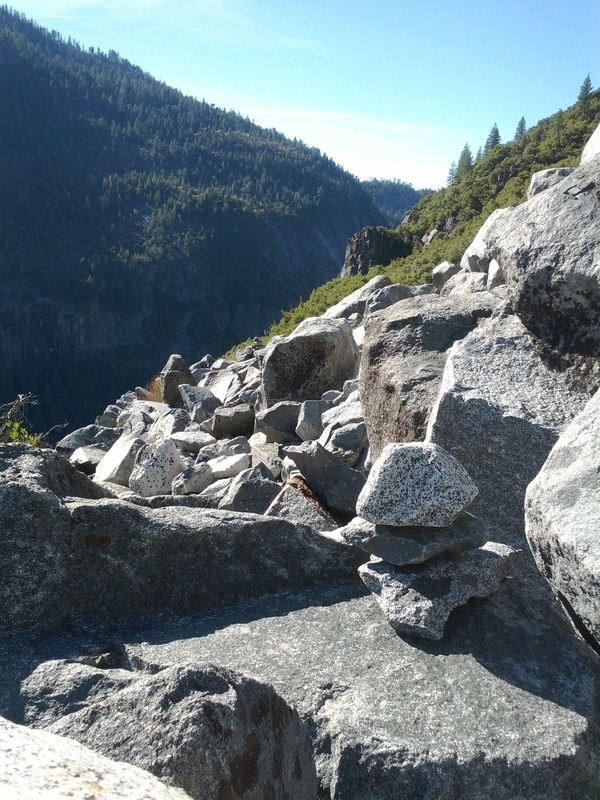 The reason Old Big Oak Flat Road can’t be used anymore is that most of a half-mile section was completely buried in rockfall in 1945. This doesn’t make for good hiking, let alone running, and seems like a good invitation for a permanent road closure. This is probably why they don’t bother putting it on any of recreational maps, which is why I wasn’t watching out for my turn off to the North Rim Trail. Can you spot both trail markers? Even with all the downed trees and the growing suspicion that something wasn’t right, I had a great time cruising down the busted old road until I hit the wide, exposed, somewhat unnavigable and slightly terrifying talus field. I’ve been rock climbing and boulder hopping before, but this wasn’t clearly stable. There were occasional ducks to mark the general direction across the slope, but they were very hard to pick out in the monochromatic jumble. When I finally emerged from the rockfall, I popped out about sixty feet uphill from the road. I generally prefer trail running to road running to running sixty feet above the road. On the way back I tried a different tactic, sticking with the road and ignoring the markers, which seemed to get me through with far less boulder hopping. However, it quickly became clear that I must have skipped the biggest section of scrambling by emerging into the woods below the road. After scrambling up a steep embankment, it seemed I was off by at least 100 vertical feet. After all the unexpected climbing, both on my feet and all fours, the last leg of the run was harder and slower than I’d hoped for, and I finished the last two miles in the moonlight. I quickly changed into warmer clothes and headed back in the direction of my campsite, stopping only at the Crane Flat gas station. They were closed – there would be no firewood for me. I was uninjured. I felt accomplished, but also exhausted. Yosemite and I had fought each other to a draw. Did I really need another day of this? By the time I got back to my campsite it was 6:30pm, dark, and getting cold fast. I quickly broke camp, packed up the car, took some caffeine and drove back to Oakland. This might not have been the best decision at that moment, but at least I knew where all my turns would be. Heading down a narrow switchback through the tall brown grass this evening meant suddenly and utterly commanding the attention of a beautiful blacktail buck. Oddly enough, my first wish was for a camera, and not for any other sort of point-and-shoot. Sport hunters may always confound me; I’m pretty much OK with that. The meadow around the bend was so thick with fauns and doe that I gave up my run and crept along on tip-toe for a good half mile. Jogging back uphill along the park’s most out of the way paved road, I spotted another young six point buck, maybe ten feet out into the brush, who watched me warily as he grazed and guarded two smaller family members. It wasn’t until I’d been standing still and watching silently for a few good minutes that I noticed the two older males, big and gorgeous creatures, seated in the tall grass, absolutely still. None of us moved until another group of humans came up from behind me, making a racket. As the last of the deer turned tail, I bolted uphill too, along the road instead of following them into their copse. I’d been just fine with my previous pace of zero per, but the run had to end sometime. On the other end of the scale, something clicked on a short downhill section about a mile later, and I found a new top speed at 13 mph (albeit unsustained, to say the least), but I did so while feeling stable and without stressing my knees. A common mantra in trail running is to go for “LSD” (because we’re all, apparently, easily amused hippies) – Long, Steady Distance – and I won’t claim to know of anything better when it comes to building up pure endurance, but even without interval drills and fartleks, there can be great joy in the extremes. Trail running, at its best, is hardly all about the speed, but we do come out here for the trail, and we come out here to run, after all.